A Cronut is a croissant-doughnut pastry invented by New York City pastry chef Dominique Ansel of Dominique Ansel Bakery. The pastry resembles a doughnut and is made from croissant-like dough which is filled with flavored cream and fried in grapeseed oil. A trademark was registered for the name "cronut" at the United States Patent and Trademark Office. In 2013, bakery owner Dominique Ansel created the pastry out of dough similar to that of a croissant (a pastry that he had been more familiar with) with flavored cream inside. The Cronut was introduced on May 10, 2013 at Ansel's bakery, Dominique Ansel Bakery, in New York's Soho neighborhood. On the same night, a blogger from Grub Street, the online restaurant blog from New York magazine, reported on the new pastry. The post resulted in much interest and online circulation, and by the third day, a line of over 100 people had formed outside the shop to buy it. Leading to the Cronut being named by TIME magazine as one of the best "extremely fun" inventions of 2013 . Within nine days of introducing the pastry to the Bakery's menu, Ansel filed for a trademark for the "Cronut" name. After the release of the Cronut, similar products have sprung up throughout the world. 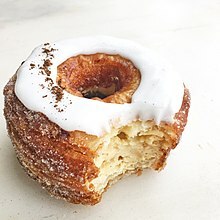 Dominique Ansel released an At-Home Cronut Recipe in his cookbook, Dominique Ansel: The Secret Recipes, in 2015, for bakers to attempt in their own homes. Like the original pastry made at Ansel's bakeries, the process also takes three days. Writing for the Village Voice in May 2013, Tejal Rao proclaimed the Cronut, Ansel's "masterpiece." Time magazine named the Cronut one of the best "extremely fun" inventions of 2013. ^ "Meet the Cronut: Croissant-Donut Hybrid Takes Pastry World by Storm - ABC News". Abcnews.go.com. 2013-05-20. Retrieved 2014-04-19. ^ Katie Little (2013-06-07). "Cronut Mania Spawns Imitators and a Trademark Rush". Cnbc.com. Retrieved 2014-04-19. ^ USPTO. "Cronut". Retrieved 30 January 2014. ^ a b "Eureka! From Gone Girl to the selfie stick – how one great idea can change your life". The Guardian. November 6, 2015. ^ a b Shunk, Laura (2013-12-04). "Cronut Wizard Dominique Ansel: "I Want to Make the World of Pastry Exciting"". Blogs.villagevoice.com. Archived from the original on 2014-02-13. Retrieved 2014-02-26. ^ Merwin, Hugh (May 9, 2013). "Introducing the Cronut, a Doughnut-Croissant Hybrid That May Very Well Change Your Life". Grub Street. ^ a b Staff, TIME (2013-11-13). "The 25 Best Inventions of the Year 2013". TIME. Archived from the original on 2018-01-17. Retrieved 2018-01-17. ^ Brendan O'Connar (May 8, 2015). "The Mysterious Persistence of the Cronut". New York Times. ^ "The 'Cronut'…Er, That's the 'Doughssant'…Has Arrived In St. Louis « CBS St. Louis". Stlouis.cbslocal.com. 2013-07-08. Retrieved 2014-04-19. ^ "Good Food - From cronut to zonut, pastry fever comes to Sydney". Smh.com.au. 2013-06-14. Retrieved 2014-04-19. ^ "Where to get cronuts in London". 2013-08-23. Retrieved 2015-09-24. ^ "Dominique Ansel's At-Home Cronut". ABC News. Retrieved 2016-07-05. ^ Tejal Rao (2013-05-10). "The Cronut Is a Doughnut-Croissant Love Child". The Village Voice. Retrieved 2014-08-13. Wikimedia Commons has media related to Cronut.